If you’re a bass player, you know the struggle of being constantly overlooked in favor of the lead guitar player. However, the bass is crucial in a band and having a good guitar will allow you to shine even if you can’t exactly play it with your teeth while kneeling and throwing up horn signs with your arms. Playing the bass is tricky and requires a great feeling for rhythm and timing, but you’ll be able to manage it if you have the best bass guitar around. Today I’ll tell you how to get one and review the best ones on the market. So, let’s get this party started! 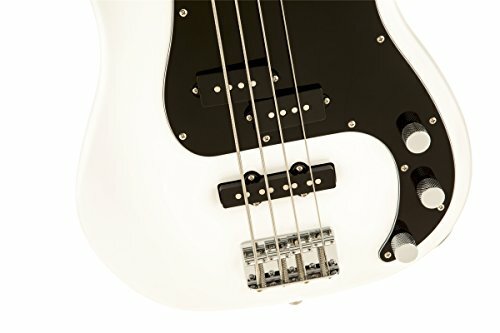 Which is the Best Bass Guitar Brand? Before you even start looking at the guitars you need to know which brand you want to buy from, right? So, which one is the best? Sorry to disappoint you but, strictly speaking, I don’t think there’s one, singular “best” brand out there – it simply doesn’t exist. There are good brands and bad brands, yes, but I can’t single out one as the best. Each brand offers something unique and something different, so it’s up to you to consider what you need and pick the best brand for you. To help you choose, I’ll give you some info on some of the top brands and a few of their good and bad points. is a household name at this point, the legendary manufacturer who made the guitars for made bass guitars for some of the most accomplished guitarists of almost any genre. Their best instruments are passive four-stringed guitars, but they do have five-string instruments as well. is a subsidiary of Fender, but their guitars are different enough to deserve a section all about them. They specialize in making beginner instruments that cost less, aren’t quite as high-quality but are easy to play and, most of all, affordable. They also make some professional-level instruments as well. If you’re a beginner though, you will want to take a look at this brand. Intermediate players on a budget should take a look at their guitars as well. is the brand of choice for most metal guitarists, though their guitars have also found their way into pop and jazz bands. They’re a long-standing Japanese company that started out copying other brands but developed their own identity. If you’re a metal musician or a beginner looking to start a metal band, you should consider Ibanez guitars as your choice. is not as well-known as Fender, but they have also been there since the beginning of rock music as we know it today. Plenty of legendary musicians have used their guitars and for a good reason – they make exceptional instruments that look great. If you want a well-made, professional-level guitar, you’ll get one right here. makes almost every instrument imaginable, so it’s no wonder they also make bass guitars. Their beginner offerings have been stellar in recent years – well-made, easy to pick up and play while remaining affordable. They also have some professional-level offerings in their lineup which won’t disappoint. Overall, they have one of the largest catalogs out of all brands, and they make reliable gear. Take a look at them no matter what kind of bass guitar you want – they might have it. manufactures high-end guitars that look great, perform well and last for decades. Their products cost a lot, but if you’re looking for cool-looking guitars that play just as well as they look, you’ll find that at Gibson. It’s no wonder they are one of the top choices among rock bands. is a relatively new American company but one that has already made a name for itself. They offer high-quality guitars on the level of Fender while also having a lot of great beginner offerings in their lineup. Their guitars are particularly good for jazz musicians – if you’re one of them, check this company out. is the ultimate choice for musicians on a budget. If you want great guitars that won’t set you back too much, you’ve got them right here. It’s the reason they’ve become one of the top choices for startup metal and rock bands. Their Stiletto series is a definite standout. Those are just some of the top brands out there, but I’m sure you’ll find at least one that makes guitars you will like. Not even the best of the best are quite sure how to pick the right guitar – they just go by feel and even then they sometimes fail. So, what can you do as a lesser player or even a beginner? Well, get yourself well-informed, first and foremost. In this section I’ll tell you what you need to consider when picking the best bass guitar for you – I hope it helps. Bass guitars can be made from many different materials, but the material used to make the body is arguably the most important factor. It greatly influences the sound of the instrument, and it should be an important factor when you choose your bass guitar. is wood commonly used to make starter bass guitars due to how inexpensive it is. It emphasizes the midrange tones over the upper ones. makes the guitar quite versatile since it’s soft and absorbs most of the vibrations. It is ideal for more complex playing due to having shorter sustain. is dense which leads to guitars made from it having a crisp and bright tone as well as a clarity that makes it sound great on recordings. It’s not as good in a live setting, but it still sounds decent. guitars sound fuller than most others and they emphasize the lower register due to its low resonance. You’ll find this material commonly used in some more expensive guitars. There are guitars out there made from other, rarer or more expensive woods, like ebony, but this is most of what you need to know. Also – avoid guitars with synthetic bodies, it nearly never works, and they sound awful. The most common number of strings you’ll find in a bass guitar is four. I find that most players swear by that. However, that is not the be-all-end-all – there are bass guitars with five or six strings as well. The four string models are common for a reason – they’re easier to play, and four strings is more than enough for most music genres. However, if you’re looking to play something out of the ordinary, having only those four strings will limit you. Five-string models offer you the option of having a lower B which is essential for jazz and useful for both rock and metal. Six-strings add even more range with a high C string on them – if you want to play some experimental jazz or be a bass soloist, this is probably the best choice. It offers much more versatility than having five or four strings. These two options are much harder to play though, so you shouldn’t pick them as a beginner. Once you’ve mastered the four-string bass though – why not give them a shot? Most of the bass guitars out there nowadays are electric ones. When people think of bass guitars, this is what most of them will imagine. They are versatile and easier to use but do require electricity and a bass amplifier to get going. Acoustic bass guitars are rarer these days, but they require nothing but your hands. They offer a more natural feel and a deeper sound. They are harder to play, and you might struggle if you never played an acoustic guitar. Hybrid basses also exist – they are rare though. They are hollow, and you can play them as either acoustic or electric, but they sound like a mix between the two. 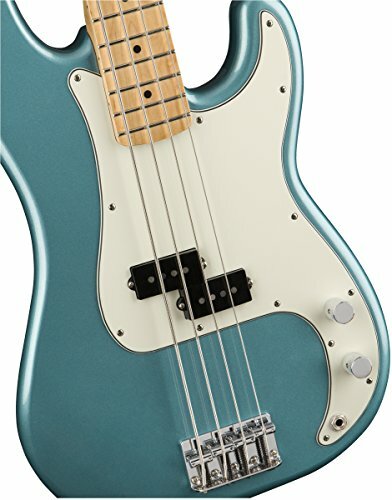 This is a beginner bass with a scale of 30, making it ideal for people with smaller hands or children. Despite being a beginner instrument, it’s no slouch, and it offers a great looking Agathis body with a rich sound and a few great features like the 2-saddle chrome bridge. It’ also got easy volume and tone control and tuning it up is a simple thing to do – even a child can tune it up. The sound is great and crisp without only minimal distortions. If you’re not an expert, you won’t be able to tell it apart from a professional instrument. Sadly, it’s not as durable as you would at expect, to the point that it is not uncommon for it to be damaged during shipping. It’s also a bit too heavy for a beginner guitar, so watch out if you’re buying it for your kid. 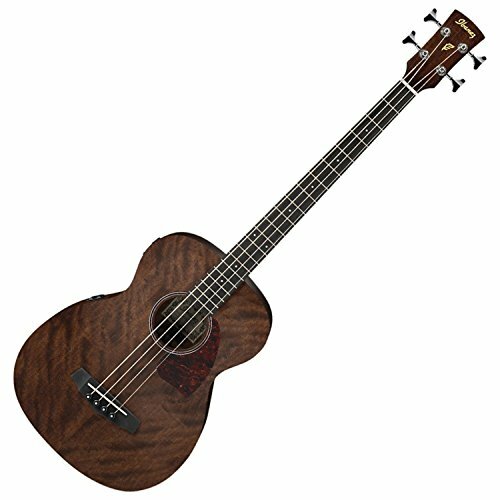 Unlike the other instruments on the list, this is an acoustic bass, making it significantly different in both sound and handling from the other ones. It doesn’t make it less exceptional though, and it’s a great instrument that’s easy to pick up and play. It’s got a solid and superb construction, combining mahogany for the body with maple for the neck. It’s all finished off by rosewood fretboards. It has a dark and rich sound to it with a variable tone so you can play it in a wide variety of styles. However, don’t be too aggressive with it or you will have problems – you have to play it lightly. Playing it is easy, and it’s quite a light guitar so nearly anyone can hold it without issues. It does have some trouble staying in tune, but if you play it lighter than an electric bass, it will sound great. It’s a beautiful and highly affordable instrument fit for beginners and more experienced players alike. This is a 34-inch basswood instrument with a maple neck, a rosewood fretboard and a vintage style to it. To be honest, I think it looks a bit drab but the proof of the pudding is in the eating, and the instrument just plays marvelously. It has a nice, soft sound that’s crisp and well-intonated. Tuning this instrument is quite easy through the Diecast Dean tuners, and the intonation can be adjusted so you can play a wide variety of styles with it. Like the entire Edge series from the Dean brand, this guitar is light and comfortable to hold, more than most others. Even with the longer neck, it will be good for beginners or those with smaller hands. The only thing making playing harder is the fact that it has only one passive pickup, though you can add more as well as an active pickup if you need it. This is not just a guitar; it’s a whole package that will help you get started with playing bass. 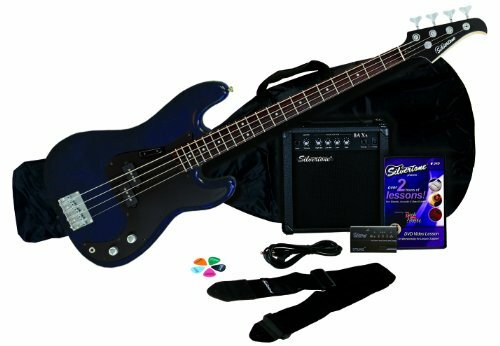 It comes at a supremely affordable price considering everything you get with the guitar – a BAX bass amp, strings, neck strap, picks, a cable, a carry bag, a digital tuner and a few smaller extras. But, how’s the guitar itself? Well, it looks cool in its cobalt blue color, the body is made of good-quality ash while the 34-inch neck is made out of maple. It sounds awesome once you get to playing it, though you might need to replace the amp and the strings included – they are not of the best quality. Overall, it’s just a great beginner bass and an amazing deal for the price. If you’re just starting out with playing the bass guitar, this one along with all the extras will help you a lot. As with most Fender products, this is a high-quality instrument made to fit its purpose almost to perfection. It has a great look, it plays well, and it has a ton of additional features. Among those features is a push-pull switch located in the tone knob which you can use to achieve a single-coil chime. The guitar does have only a single coil but its split into two, providing a smooth tone. The pickups also sound great with almost any amplifier, even a cheap one. The sound is choppy, bright and vibrant. Even if you don’t care about all the advanced feature, this instrument is easy to use and tune, so it can fit even a beginner. The price tag is a bit higher, but it is worth the cost. The only major downside is the flimsiness of the materials. It’s still a nice guitar but not as durable as you would expect from a Fender product. As I said when it came to brands – there’s just no way to pick one as the best out of all. It’s all a matter of taste and what you need out of your instrument. So, this is just my personal judgment and not an absolute truth, but I think that the Fender bass wins out today. It’s just a great guitar for almost any skill level, it plays like a dream and looks like a dreamboat. It’s not as durable as I thought it would be but it’s still a kickass bass, and you can’t go wrong with it. What are your thoughts on the matter? Would you pick a different guitar? Sound off in the comments, and I hope I’ll see you next time as well.